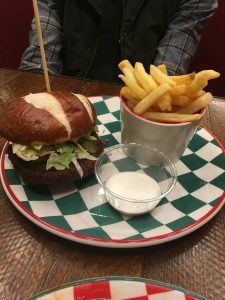 On the last day of Veganuary I went to try Frankie and Benny’s vegan menu. I’ve only been to Frankie and Benny’s a few times before and I can remember there being a lot of choice but it being quite meaty. I was really excited when January came around and among the new vegan products and menus was Frankie and Benny’s vegan menu. I’m the kind of person who has to read the menu before hand. Food is a big decision so I need time to think. I was amazed at all the vegan options as there was a really good variety. I was stuck between the Mac no cheese, Kansas City bbq pizza and the “I ain’t no chicken” Parmigiana. I eventually decided on the parmigiana because I still haven’t tried Papa Johns or Pizza Huts new vegan pizzas so I can have them any time, and I’ve had a few mac no cheese’s before. We shared a garlic bread for a starter. We had a few people serving us and I was really impressed with how knowledgable they were about he vegan dishes. They had noticed that we both ordered vegan options (Billy had the Viva la Vegan burger) and let us know that they now had vegan cheese which e could add to the garlic bread. 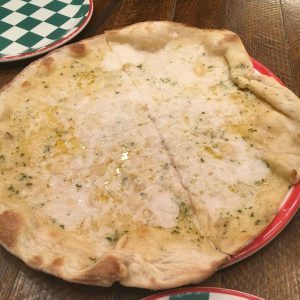 The garlic bread was really tasty with a rich flavour. It was pretty big and I’d definitely not have been able to eat my whole meal if we didn’t go halves on the starter. When the mains arrived I was surprised at the size of mine. I had seen photos online and each one was different so I wasn’t really sure what to expect. 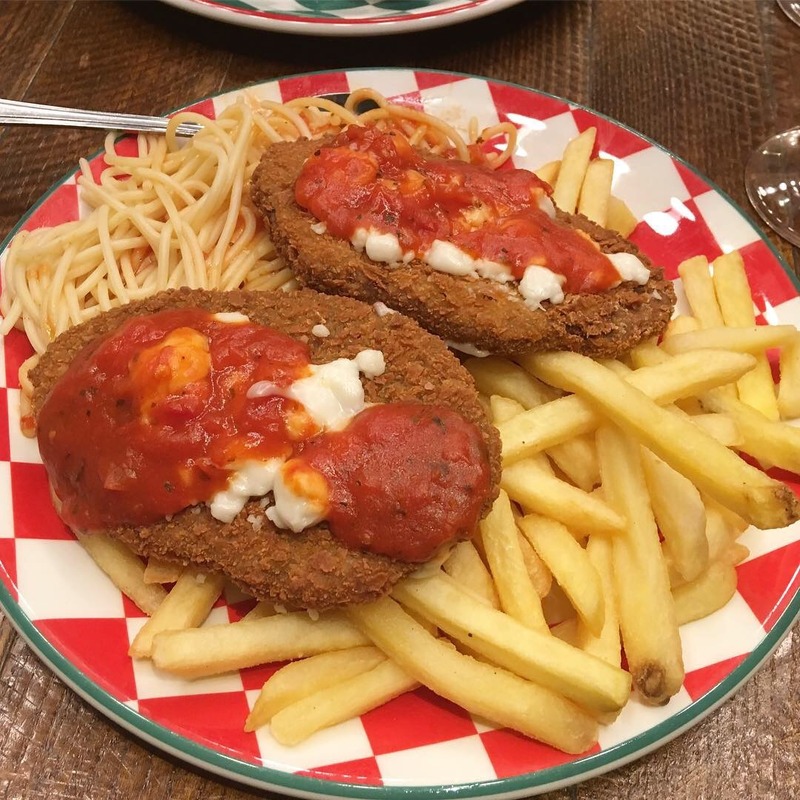 As the “ain’t no chicken parmigiana” is part of the grill menu you can choose between fries, salad or veg and obviously I chose fries because I can’t resist. I’d probably go for salad next time because it came with a pretty big portion of spaghetti too. The ‘chicken’ was really nice and the spices made it taste a bit like southern fried chicken. There was just the right amount of sauce on the chicken too. I was really impressed! Billy really enjoyed his burger. He asked for it without the burger sauce which they were happy to do and when they brought it to the table they explained that there was a little pot of vegan mayo with it. I thought this was great and another example of how good the service was. Sometimes I’ve had a meal come with a sauce and not eaten it because I didn’t know if it was a vegan version (I’ve actually been given non vegan coleslaw with a meal before). I was so full but somehow got persuaded into having dessert (if you know me you know you just need to suggest pudding and I’m in). There are a few options for vegans and we went for the chocolate and raspberry cake to share. 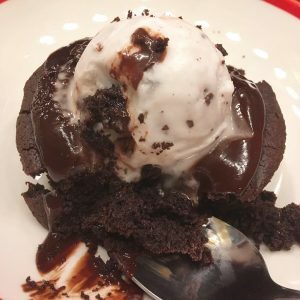 It came with chocolate sauce and a scoop of vegan ice cream. It was so delicious and really rich. It’s safe to say I left feeling very, very full! I’ll definitely have to go back to try the other vegan options. It’s nice to have somewhere else where you actually have a choice and there’s something for everyone which is good if you’re the only vegan.